Owner/Operator of Kingfisher Cruises is Benita (Lamond) Cox. Benita has a double degree in Applied Science - Parks, Recreation & Heritage & Applied Science – Eco Tourism from Charles Sturt University. Also a qualified Eco-guide, Benita enjoys sharing her “office” giving a commentary for most of your journey. I am such an autumn person. Give me a quiet cosy spot with a view out the front of my boat windscreen of the changing trees on a crisp, April day, a warm drink and some wonderful company on board and I am in my glory. It’s been another perfect week out on the water taking in the sights of the azure kingfishers, red belly black snakes, spoonbills, egrets and pelicans. Hope the Bunny brings you lots of chocolates. You will also find updates and photos on our cruises on our Face book page: www.facebook.com/kingfishercruises1. Please take a look and like us at the same time. And please remember bookings are essential. 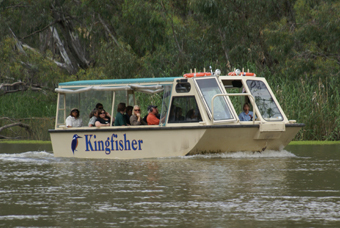 Cruises depart from the Day Visitors Area, Barmah Lakes on Sunday, Monday, Wednesday, Thursday and Saturday.